Jullian Khala is senior manager for field marketing and informal markets for Telkom’s 8ta brand. She is responsible for the management of the outsourced field marketing team for strategic brand positioning. She was previously executive head for community-based services at Cell C (Pty) Ltd. Under her management, Cell C achieved its license obligations in record time. 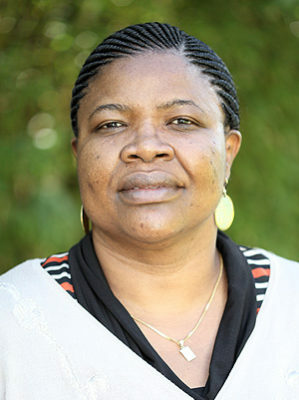 Jullian spearheaded training of previously disadvantaged individuals in analytical chemistry at North West Technikon (now Tshwane University of Technology), where she was associate director at the school of chemistry. She has been instrumental in developing thousands of entrepreneurs through the creation of telephony-based businesses in communities throughout South Africa. Jullian holds a national diploma in analytical chemistry from North West Technikon (now Tshwane University of Technology), a higher diploma in chemistry from Technikon Pretoria, and an MBA from Demontfort University. She is a Fellow of the fifth class of the Africa Leadership Initiative-South Africa and a member of the Aspen Global Leadership Network.